Home Posts tagged "audrey mok"
Riverdale’s in chaos in this early preview of ARCHIE #32! “We’ve got a crisis here!” It all comes down to this! The Riverdale gang—held hostage by Cheryl Blossom’s father! Reggie—at last paying for his crimes! Will Archie be the hero his community needs? When all is said and done, Riverdale will be turned upside down once more! 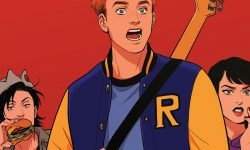 Heart of Riverdale continues in ARCHIE #24! Check out an early preview!